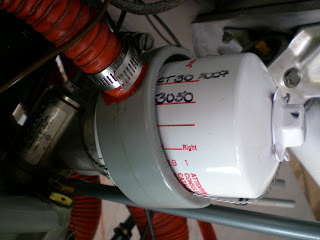 Here are the photos of my home made oil cooler for the Continental O-300. It actually takes about 15 degrees out of the oil on these hot summer Texas days. Take a close look. This is a Rapco vacuum pump cooling shroud! This customer installed the Rapco vacuum pump cooling shrould around his oil filter. 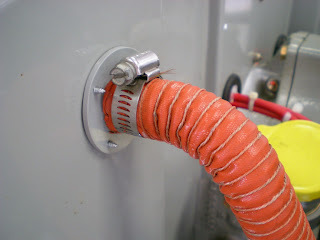 Neat idea and it reduced oil temperature by 15 degrees! what you are doing with this air blast system is simply cooling the engine thermastat that is just in front of the FM oil filter. You are not cooling the engine oil per say. You are just getting lower oil temperature readings because of the now cooled thermastat. I could be wrong but I don't believe this engine uses a thermostat. Are you referring to the temperature probe?